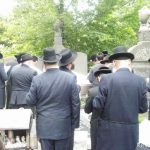 Thousands participated in prayer, reciting Tehillim, at the gravesite of Rav Yaakov Yosef Joseph, in Union Field Cemetery in Ridgewood, Queens on Thursday, 24 Tammuz, (July 16) in commemoration of the Chief Rabbi’s 107th yarzeit. Hundreds of candles were lit, intensifying the day’s heat. Thousands of tearful prayers of supplicants were heard all day long, beseeching Hashem to answer all tefillos and ease their oppressive burdens. 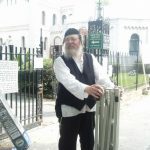 Many thanks to the continuing efforts of Rabbi Yonah Landau (pictured), Chairman of the Committee to Visit Jewish Holy Sites in America for arranging the extended hours, cold drinks, and light refreshment. “It’s amazing to see the thousands of people coming to daven. I have been coming for over twenty years now.” , said Rabbi Baruch Feeder of Brooklyn. “There were many years [back then] that I was the only one to show.” This is the New York version of Lizensk said another. In 1888, Chief Rabbi Joseph came to New York after serving as Shtut Maggid (Town Preacher) of Vilna for almost 15 years. While at first the Chief Rabbi met with much success in improving the standards of Yiddishkeit in America it was not to last. In the end he passed away a broken man after a prolonged illness that left him speechless and bedridden for the last 4 years of his life. A story is told that in the last year of his life, Rav Joseph regained his speech and with assistance was able to walk. Wanting to express his thanks to Hashem he asked that he be allowed to deliver the upcoming Shabbos Shuva Drasha. The upcoming drasha was widely publicized throughout the city. Shabbos morning in front of an overflowing audience Rav Joseph slowly with assistance ascended the bima (lectern) and began with the words, “Shteit in Rambam”, he then fell silent and moments later burst into uncontrollable tears. After a few moments he said, “Du vaist vus es maint tzu fargessin a Rambam far dem illui fun Volozhin” (Do you understand what it means for the Illui from Volozhin to forget a Rambam) and with that he sat down. The drasha had a tremendous impact on the community. They saw that nothing could break the Chief Rabbi’s spirit, that is, nothing except the inability to recall a Rambam. A few months later on the 24th of Tammuz he passed away. About 100,000 people attended Rav Joseph’s funeral, one of the largest to date in New York City. The leading Torah authorities in the United States eulogized him. Each one, stepped forward to defend the late Chief Rabbi’s honor, chastising the people of the city for the way he was mistreated. The Chief Rabbi of Pittsburgh, Pennsylvania, Rav Moshe Shimon Sivits, cried out, “that Rav Joseph was only honored twice by the people of New York City – once when he arrived and now that he was gone”. The late Satmar Rebbe, Rebbe Yoel Teitelbaum intensely studied the life and times of New York’s Chief Rabbi and would encourage his followers to daven at his kever. May all the tefillos be answered, Amen. I was there as well, along with hundreds of others, a suggestion for next year they should try and do something about the parking. Was the Satmar Rebbe’s research on RJJ ever published, if not who has it? The last paragraph, is bogous, the Satmar Rebbe did mention once in a meeting on how RJJ was not succesful and the reasons he taught were behind it, naming it on the fact they have bnot worked enough for education. But to say that he “intensely studied the life and times of New York’s Chief Rabbi” is an overstatment for the least part. The second point that he “would encourage his followers to daven at his kever” is just as made up, since no one can recollect any presence at his Kever till a few years ago when Reb Yonah Landau started arranging those trips. I am glad you took the liberty to express your opinion in the form of a comment, they are welcomed and encouraged. In response, I would like to first point out that I am not of age to remember the late Satmar Rebbe therefore my positions are biased on printed materials and conversations with his talmidim and friends. Some of whom I met at the Chief Rabbi’s kever. Talkative in nature, I always try striking up conversation especially with amuliger yidden. You are correct, the Rebbe did make the point that the lack of an educational system was a key misstep on the part of the Chief Rabbi. I have heard this repeated countless of times. As for the intensity of the subject, although I know little about the Satmar Rebbe, I can clearly state that EVERYTHING the Rebbe did was with intensity, clarity, and devotion. Haphazardly, was not in the Rebbes dictionary, regardless of the subject. The stories are endless. I would further suggest that you look up the word intense in the Merriam Webster Dictionary. Your final point of giving Rabbi Yonah Landau the credit of “discovering” Rav Yaakov Yosef kever is incorrect. Yes, Reb Yonah is the driving force behind the sudden surge at the kever and Reb Yonah has made it his life mission to promote kivrei tzadikim across North America as is evident in the effort and devotion he puts into it. However, to claim that it was his discovery is a misstatement. I personally know people who have been going to the kever for the last 30 yarzheits. I am friendly with someone who has been going the kever ever since he was a young adult and is now pushing 70. Additionally, a few years ago I met one of the Rebbe’s talmidim at the kever. During our conversation he related that it was upon the Rebbe’s instructions that he has been frequenting the kever for over 40 years now and that he is not alone. Thanks Baruch for your response. I guess that if several people went to the kever based on the Rebbes encouragement, while the Rebbe litterally had tens of thousands of followers that would of followed his instructions, it is rather a private story in an individual case and not the Rebbes vision as a whole. 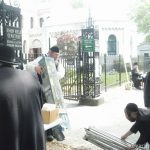 I would further add, while attending Kivrie Tzadikim on the day of thier Yahrtziet has been a practice by Chasidim ever since there founding, it has not been the case by Litvishe Gedolim. 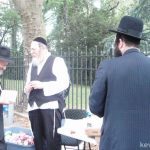 The Rav Hakollel deserves a lot of credit and respect, and it is an important thisng that peopleshow support for maintaining these Kevarim by visiting them. But from this to make it as a Lag-Bomer style day, is pretty much overdone in my opinion, and would not say that the Satmar Rebbe would make this a custom. Thanks for making place for open conversations. Having researched a bit the topic of kivrei tzaddikim in America and wirtten on the subject, I would like to say the following: While visiting a tzadik’s kever is indisputably more practiced in the Chassidishe world than the world of the Litvishe yeshivos, the origin of going to kivrei tzadikim actually has its roots in the Gemara in . Taanis 16a and Sotah 34b. The Rema writes in Hilchos Rosh Hashanah that it is customary to daven at kivrei tzaddikim on Erev Rosh Hashanah, upon which the Mishnah Brurah explains that a kever tzaddik is a sacred place where prayers are more readily accepted since they are buttressed by the zechus of the tzaddik at rest there. (see article elsewhere on this site for more on this). Also see Rashi at the top of Yevamos 122a which speaks of the practice of visiting a tzaddik’s kever on the yahrzeit. In our times when Klal Yisrael is beset by so many difficulties, both communally and individually, this is one way to bolster our tefillos to generate rachamei Shamayim. Regarding Rav Yaakov Yosef’s involvement in chinuch I would venture to say his involvement rectifying matters in kashrus and shechitah allowed him little time and energy left to see to advances in the area of chinuch. Again, his other involvements in Rabbanus probably took up a tremendous amount of his time and energy. I would alco like to add that I happen to have a cousin who is litvish and in general does not go to kevarim.A few years ago he happened to pass by near the Union Field Cemetery and the person with whom he was travelling suggested to him that he should go to be mispallel at Rav Yaakov Yosef”s kever. Since my cousin had learned at the yeshiva named after Rav Yaakov Yosef ztl(RJJ) he listened to him and was mispalel there. After only a few days if even that he found a very nice shidduch for his daughter .My cousin is not into metaphysics or extreme thinking and normally would be even skeptical about such ideas but he told me that in this case it was so blatant and clear that it was in the zechus of going to Rav Yaakov Yosef zatzal”s kever. Another point is that the idea that going to kevorim is only chassidish is also not exactly so. I was zocheh to hear from Rav Yisroel Zev Gustman ztl a number of times that when he was in Vilna before the War he went to the Gra”s kever over a thousand times.I also heard from talmidim of his that when he once went to Tzfas he made a point of going to the old beis hakvoros there. (For whatever reason he made a point of mentioning that he was in the meoro of Chana V”shivo boneho) so it certainly is not only a chassidish idea and should not be sterotyped. It is also mentioned in Kitzur Shulchan Oruch in the Halochos of Chodesh Elul in a very elaborate way besides the Gemora in Sota. In addition it is clear that their is no real reason not to have a big gathering like at Meron .It is not chas vesholom a contest who is greater or in any way a pegiah to any tzadik if a gathering is made by another tzadik which could possibly and very likely does bring yeshuos. In this vein it is known that in pre-war Europe there was a fairly large gathering at the kever of the Ramo in Krakow on Lag Baomer(as the yahrzeit of the Ramo was on Lag Baomer). We never heard anyone protest that although the Ramo coauthored the Shulchan Oruch he certainly was not a tanna(especially like Rashbi who was in a meora for many years and wrote the Zohar). Apparently the gedolim of Poland and Galitzya held that there was nothing wrong with it and might have even encouraged and endorsed it so certainly there is nothing wrong chas vesholom to arrange a large gathering on Rav Yaakov Yosef”s kever even if it would be similiar to Rashbi in Meron . (Perhaps something could be done throughout the year at other times as well at his kever not only on his yahrzeit). Another point is that whatever the late Satmar rov ztl said about Rav Yaakov Yosef ztl not setting up a system of education it is clear that he did not mean in a critical way.Knowing the great constraints of those times namely being totally tolui bdaas acherim of people who at the best were apathetic to the importance of an organized system of chinuch and on the other hand dependant on their support limited if not made impossible to achieve such a goal .Even so it was not a black and white situation and as mentioned even in the area of chinuch he was succesful to some degree. This goes beyond the realm of being malamed zechus just understanding the true historical rality of those times and understanding that nobody else would have achieved more. In addition indirectly or sometimes directly the later success in establishing an organized system of Chinuch was due in part to the fact that Rav Yaakov Yosef ztl and other great Rabbonim of his time broke the ice with their mesirus nefesh and chochma. (similiar to l”havdil the american troops in D-day in ruchniyus).Perhaps this was the reason the Satmar Rov ztl encouraged some of his followers to visit his kever.His comment about not organizing a system of Chinuch was also not meant in any way as a critique, chas veshalom. Especially the late Satmar Rov ztl whi in addition to being a tzadik was known for his keen down to earth practicality and realistic understanding of reality was aware of this .He was merely stating that the reason Rav Yaakov Yosef ztl was unable to accomplish more was due to these constraints. Thanks BZR, you are absolutely right on target with my point on the Satmar Rav Z”L, and that is exactly what the Rebbe said that we have to take the history and Learn from its mistakes, of course he was not C”V criticizing the works of the Rav Hakollel. Despite the extreme heat (100+ degrees), the place was mobbed at the end of the day… truly amazing. What’s even more amazing is the diversity of the crowed… you might think the BSH”T himself is buried is here. On a historical note: I was told that today is also the yahrzeit of Mendel Beilis who is also buried in Union Field, I am not sure if he was religious or not. Mendel Beilis is buried in the “tear drop” section of the Mount Carmel Cemetery right near Rabbi Yosef Peimer the Slutsker Rav. Reb Yosef Feimer is actually a grandson of the first Reb Yossele Feimer (Slutzker). 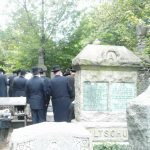 Yes, Mendel Beilis is buried right next to Rav Feimer. Does anyone know if there was a connection between them? Wo is the cantor with the flowing white beard mentioned in the article? Anyone knows what’s with The Rav’s son Michael mentioned in the article? Was he frum? Does he have descendants? I would say it’s a typo the Chief Rabbi only had one son Raphael or perhaps it was a relative. Farshlufen, thanx a ton for the link – 1st time to see a clearer picture of him. I’ve uploaded a few pictures of the Rav Hakolel z”l. In the same folder is a picture or two of Rav Notkins’ thingie, a bit disheveled. Check out how many brick are laid at the head of the kever. Does anyone know the source of writing a request on a brick and placing it at a kever. I saw one by Rav Pam z”l, Yampole Rebbe z”l and Chofetz Chaim’s wife or son. Is Rav Notkin’s Kever on this site? Picture #19 is of Henry (Tzvi) Chuck’s marker, he was one of the founders and biggest contributor of the Beth Medrash Hagadol (his father Yerachmiel was still alive and he joined along with his father). He together with two other individuals came up with the idea of bringing a Chief Rabbi. He was an extremely rich person. Chuck was born in Berlin (it reads on the matzeiva 14 Teves 1829), the year of his passing is unclear) he was a big Talmud Chochom and Yerai Shomayim. פ”נ על אלה אנו בוכים על פטירת אבינו היקר הקדוש והטהור מופלג ומפורסם איש צדיק ..ניו בכל עניניו צדיק בכל דרכיו … בכל מעשיו ….. …. I snapped this marker as Baruch once mentioned something about him – thanx for posting. This discussion here is a true wellspring of Torah and Minhagim and I congratulate the founders of Kevarim.Com for their invaluable contribution to Yiddishkeit. May Heaven reward them. The Chief Rabbi zt”l did establish a yeshiva, name later changed to Yeshiva Harav Yaakov Yoseph (RJJ) after his passing. RJJ was to become a major establishment of Limud HaTorah. Regretfully, the establishment of the Yeshiva was in his later years. In hindsight, “Monday Morning Quaterbacking,” the Chief Rabbi should have indeed put his valuable Kochos (efforts) into Chinuch. This is, however, in retrospect. The Chief Rabbi, being on the very battlefront, surely understood the need for Chinuch but decided, in his towering Torah wisdom, that the battles that he undertook, i.e. Kashrus, were more important at that specific time. Without disrespect to the late Satmar Rebbe zt”l, it is not for us, after-the-fact, to second-guess the Chief Rabbi zt”l. We must accept that he well knew into what he was investing his work and life. Our remembering the Chief Rabbi blesses us. Rabbi tannenbaum is correct. It is not for us to second guess the Rov. He focused on kashrus,because he saw it as the urgency of the moment. Yidden were eating treif r”l. Chinuch takes years to have an effect, even if in the long term it is equally as important. When a person comes in to the emergency room with a life threatening illness, you can’t fix that with regular medication that is used for prevention. The rov was a baal mesirus nefesh. We are in no position to second guess him. May he be a true meilitz yosher and help bring the geulo shlaimo. The satmar rebbeh repeated what RJJ said at the end of his life and yes he took a lesson from his mistake, he didn’t say this to second guess him he had nothing but respect for him. Are the writers on JDN school kids? where can i find his sefer? Alan, the numbet is 212.334.9285 ask for Marvin Schick or email mschick@mindspring.com. An older print is also avail at http://hebrewbooks.org/6002. It doesn’t include likutim, of which many pieces are from sefer Kehillas Yitzchock (Al HaTorah). Reminder: Yesterday, Shabbos, was his Yuhrtzeit for those that wish to visit his kever.